The Custards: Sunny Spring days.....a little late! "Earth has not anything to show more fair" than a springtime post from The Custards!! What an absolute delight all of this is and so much of it we are, unashamedly, wishing to covet!! How we love it all, but especially the arrangement of containers filled with spring bulbs/flowers on your terrace -so pretty - and your two Lloyd Loom chairs which we should like to steal. Fabby, as our friend David once would have said! This is the such a perfect time of year and we do hope that you are enjoying every minute. Thank you for your comment left on our latest post and to which we have made reply. To see it, go to comments and click on Load More!! Spring is making way for summer but it has been delicious. Hi Jen, Spring is such a glorious season. Your photos are so pretty, and happy I enjoyed viewing each and every one x.
Ooh and thank you for your kindest words always....I could see the sparkle ~ est twinkles that you left on the comment page.....Simply dazzling, my friend! How very kind you are - it is the best time of year I think. Many more twinkles to come! Jenny, I love following your blog...have never commented, but enjoy it so much. Loved the pictures and have been waiting about three weeks for you to post:) Missed the words, tho. You are a delight! Are the Easter eggs cloth covered? Thank you kindly Terri and welcome to this old blog. Got my voice back so will be writing again soon! These particular eggs are older than some of the others that I have shown here in years gone by - these date from 30s or 40s I think and the eggs were just made that way, a paper/cardboard design. Hi Jenny - despite my being April born, spring has always been my least favourite season. But what a joy is your blog, with every picture here an inspiration. Only you could convey so much feeling in a single photo - the open door with the key and the blue bench behind made me feel as if the meaning of Spring has finally been made clear to me. I've been waiting. And now I am jealous. Sooooo jealous. A house full of nick nacks helps! I have finally dug out the 'before' photographs and will make a post about them eventually - it has changed a bit! Well observed Ms Ethel - I think the leg's owner got cheesed off! La di dah !!! Poor scruffy bunny usually lives with Bronte in her bed! soooooo much gorgeousness ...someone has become a professional photographer I see? Lovely images...bestest to you...Happy Easter or am I becoming confused? Jenny, loved your post full of the wonders of spring, color, plantings and to die for food. Love to see your corner of the world someday but for now I have a lovely hostess in you. Thank you so much. Dear Sheryl - thank you soooo much for your kind words, I am blushing here. House in chaos at the moment due to redecorating...........again. Stunning images Jenny..such a pretty courtyard too!..I can see why you sit there and enjoy tea and cakes!!! Hi, lovely pics but I miss your ever funny and thought provoking words. New to your blog but already making me chuckle. Hello Frances - thank you so much for calling in and your generous words. I like to laugh! That's a big thumbs up from me. Blooming lovely! I do love my flowers! oooo, lovely ! lush really is the only word for all this spring loveliness. it cheered me up no end ! Thank you Frances - a busy time of the year in the garden with so much going on. I love the peaceful feeing that I get when I see these pictures. Thank you kindly Ginny T - I do like a MLA illustration! How lovely- I came home feeling tired and weary and now I feel revived and cheery! Only saw one swallow this year - how sad that it. How wonderful to hear a cuckoo again - I was watching Spring Watch and Chris the cuckoo last night - what a marvellous bird! What a wonderful lift for a rainy day! I love all your photos, and I'm going to take notes on those beautiful pots of flowers for some inspiring planting ideas...when the rain stops that is. I have a box of Easter decorations that didn't see the light of day this year, so it's lovely to see yours! I'll skip the chocolate if you don't mind- one poorly child sent home from school- best not to mention food! Belated thanks Felicity - I hope poorly child is fully recovered! Bit of a murky day again today but the flowers are shining through! It's POURING with rain as I type this so thankyou for a spiffingly good bloggette,after trying hard to decide which is my favourite I think I'll plump for the divine Hyacinths in the pink jug!! AND if you dare to say that you made those cakes yourself,I'll scream and scream until................. you send me a slice!!!! TTFN Pam. Thank you for calling in - at least we have had a glimpse of sun in the interim! Sadly I did not make the cake but came from the local cafe - one slice is really enough for all four of use I think but I cannot help eating it all. Please do Julie - though it is a bit overcast today sadly. Gorgeous photos. So cheerful. I gave a little gasp when I saw that hollyhocks plate. I have side plates and a cake plate in the same design, but a different, shape that I inherited from my Grandma. I have loved them since I was tiny and she left them to me. It was lovely to see another. How lovely Kate-Em - it is lovely china isn't it and I find the pattern lovely just to stare at! So many splendid things I don't know where to start! Thank you Nicky - I was thinking about you the other day and wondering about your garden. how is it going this year? You are spoiling us with all these wonderful photographs! It is a special time of year I think - so much to follow too! Many thanks for the reminder!!! Just found your blog througt The Hattatts. How pretty it is! 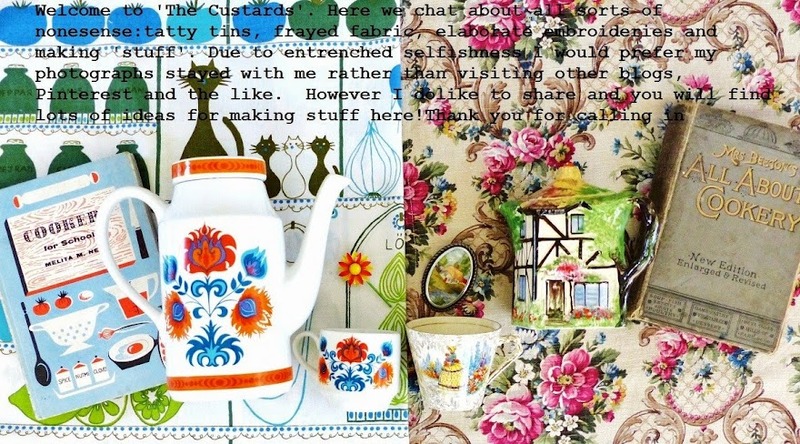 I see we share a love for vintage porcelain and fabric. It's a joy to scroll through your photo's.